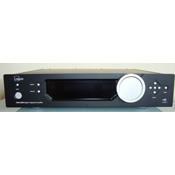 The TDAI 2200 true digital integrated amplifier is the most versatile amplifier in their range. The standard version of the compact 2 x 200W digital control centre can be expanded with analog input module and the outstanding RoomPerfect room correction system. The TDAI 2200 is a fully digital amplifier from Lyngdorf based on the experience gained during the design of the new Millennium platform. The TDAI 2200 is much more than an amplifier, it is a complete digital signal processing control centre for designing advanced audio systems based around active loudspeakers. Active meaning use of active cross-overs instead of ordinary passive filters. Absolutely SUPERB product! After a life filled with all manner of audio equipment, hundreds of hours in listening rooms, dozens of live concerts and operas, countless time spent listening and recording in small, cafe-sized music venues, and thousands of hours of playing various pianos, I have reached the blissful end with my beloved Lyngdorf electronics. Besides the TDAI 2200, I also own the CD1 CD player. I have been through years spent with vacuum tubed amps, monoblocks and preamps, dreaded solid state electronics, and even built a stout Tripath module-based digital amp. Brands I've owned and lived with over the years: Eico, Heathkit, Dynaco, Hafler, Kenwood, NAD, McIntosh, Perreaux, Audio Research, Nakamichi, Tandberg, Threshold, Vincent, Sony, Phase Linear, and more. All of what I've sought over the decades I have found in the Lyngdorf products. This includes a minimum of interconnect cables, utter simplicity of design, amazing flexibility, first-rate build quality, a slew of input options (digital and analog), pre-amp outputs for left and right subs, and almost best of all, the amazing ability to elegantly deal with problematic room acoustics which have plagued me for decades. On top of that, all the usual superlatives: immediacy, control, delicacy, "getting out of the way completely", amazing low end control, airy spaciousness, musicality, surround sound venue acoustics with two speakers (which requires incredibly good temporal resolution), and pin-point placement on the virtual stage. OF COURSE, the speakers, crossovers and speaker cables you use will play a big roll in what and how you hear, and what you can actually resolve. Then there's the quality of the recording. Add to that the variability of our ears, and clearly your own experience with Lyngdorf electronics may vary. In my humble opinion, the TDAI 2200 is worthy of the very finest ancillary equipment. The room correction circuit delivers as advertised, and even handily tames dual subwoofers, without the need for any external processing, eq, or correction. Simply amazing product, and all in one tidy but hefty chassis! Do yourself a favor, and audition a PROPERLY CONFIGURED Lyngdorf integrated amp if possible. Ideally, try to bring it home, tune it to your room (~15 minutes with provided mic), and be prepared to be blown away! Finally, the audio press is giving Lyngdorf audio its due! I am in no way connected with Lyngdorf other than through my love for what this design is capable of. I have owned the TDAI 2200 and CD1 for over four years. Handles audio structure such as timming and beat in a very good way. It does not get to sharp and it has plenty of muscle. It´s good for a short listen to a couple of songs. This is basically mp3 upsampled sound=digital. If you really wan´t this clinical in your face sound, but just with alot more depth then I suggest EAR og even GAMUT, which will last longer.